Count down to the fabulous Malaysia Year of Festivals 2015, or MyFEST 2015, as we herald the country’s endless celebrations of festivals, events and happenings. Continuing the momentum and efforts of Visit Malaysia Year 2014, MyFEST 2015 is set to make Malaysia the top-of-the-mind tourist destination, encouraging tourists to stay longer in order to enjoy the festival offerings nationwide. Themed “Endless Celebrations”, the year-long calender is packed with festivities of every genre; for instance cultural festivals, shopping extravanganzas, international acclaimed events, eco-tourism events, arts, music showcases, food promotion and other themed events. The Malaysia Year of Festivals 2015 campaign leverages on smart partnerships in line with the National Blue Ocean Strategy that nurtures stakeholders engagement, support and participation. The symbiosis enables Malaysia’s tourism efforts to be competitive and to remain one of the prime contributors to the socio-economic development of the nation. Stakeholders and industry players should be united and Malaysians should come forward in the spirit of unity during Malaysia Year of Festivals 2015. As Malaysia Year of Festivals 2015 is a national mission, it is envisaged that government agencies, the private sector, non-government agencies and industry players will come together and make the national campaign a success. The year 2015 will be known as the Malaysia Year of Festivals (MyFEST) 2015. The MyFEST 2015 campaign will continue to boost the tourism sector and ensure that the Malaysian tourism industry remains robust after the Visit Malaysia Year 2014 campaign. As Malaysia is blessed with various cultures, the new campaign seeks to showcase and celebrate Malaysia’s bountiful, diverse cultures and various festivities. The design for Malaysia Year of Festivals 2015 logo depicts a traditional musical instrument known as the Rebana Ubi. 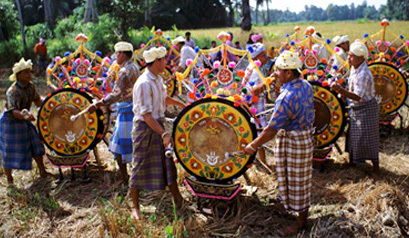 The drum is a musical instrument which can be associated with Malaysia’s multicultural society, in line with the spirit of 1Malaysia. Therefore, the logo design reflects an important part of the country’s heritage, traditions and culture. The Raja Muda Selangor Regatta is held annually since 1996. The patron is HM Sultan Selangor and attracts renowned yachting enthusiasts all the way from Australia, New Zealand, United Kingdom, Singapore and Malaysia. Participants include professional yachters and it is listed in the international regatta calendar. Every year, the Ministry of Tourism and Culture Selangor is entrusted with the task of organizing exhibitions as well as a gala dinner which will be graced by HM Sultan Selangor. George Town was ranked 3rd in 2012 by Virtual Tourist for having the Best Street Food. George Town was ranked in CNN Go’s Asia’s 10 Greatest Street Food Cities in 2012. George Town was ranked 12th in the New York Times’ Frugal and Food Category in 2009. Penang Assam Laksa was ranked 7th in CNN’s World’s 50 Most Delicious Foods in 2011. Time Magazine when awarding Penang as the Best Street Food is Asia in 2004 cited, “nowhere else can such great tasting food be so cheap”. During the Indian Muslim Culture Celebration 2011, 30 tea acrobats took turns to display their showmanship for 10 hours non-stop and earned themselves in the Malaysia Book of Records! The longest chain of Roti Canai – 400 metres long from 2,786 pieces – was created during the George Town Festival 2012, making it into the Malaysia Book of Records! The largest “Teh Tarik” cup is 7 feet high and 4.5 feet in diametre, and can hold 8,000 cups using 1,000 cans of Dairy Champ Sweetened Beverage Creamer and 30 kg of tea leaves! “Nasi Kandar” an Indian Muslim dish originated from Penang on the streets where the hawkers would trek through dusty streets, bearing baskets of food and rice hanging from a yoke across his shoulders. The yoke was called “kandar” in Malay. Ice cream connoisseurs will be fascinated at Malaysia’s unique “Coconut Shake” which is available in many stalls in Melaka. Old Town White Coffee is the largest kopitiam restaurant chain in Malaysia. Its main headquarters is in Ipoh, Perak. The event is a platform for the creative industry to develop and maximise its potential. Joget 1Malaysia epitomises Melaka’s lively traditional dances from various cultures to make it a centre of local and international art and culture. The World Kite Festival, Pasir Gudang is an annual event that features numerous kite players participating in various unique activities involving sports, culture, tourism, recreation and leisure. These activities are free for all nationalities of the world to attend through one ambition and culture of kite flying under one sky. Entry is open locally as well as internationally to about 30 different countries. This unique art festival features the aboriginal/ indigenous peoples from various countries: Maori (New Zealand), Aboriginal (Australian), Zulu (South Africa), Aboriginal (Papua New Guinea), Samoas (Samoa) and Malaysia’s Orang Asli. A highlight is the village lifestyle embedded into musical and danced performances which are rich with presentations, displays and manifestations. Visitors will also be able to view unique crafts and arts during the festival. A festival that introduces the various species of durians popular in Penang, such as Raja Kunyit, Udang Merah dan many others. The festival provides an opportunity for visitors to experience Javanese community food icon in Selangor by maintaining the original concept of eating rice ambeng with trays when dining. Tourists are also presented Javanese culture experiences. Borneo Jazz Festival was introduced in 2006 at ParkCity Everly Hotel, Miri. It is a festival awaited by fans of jazz music and promotes Miri as a tourist destination. Adjacent to Brunei Darussalam, the event attracts many visitors from Brunei to stay longer in Miri. This event is part of Sarawak’s efforts in the conservation and preservation of the natural environment through the music world with the main objective of attract foreign tourists to the state to enjoy its natural beauty, culture and unique tourism products. This mobile app is for Visa cardholders residing in the Asia Pacific, Central Europe, Middle East and Africa regions. Not only is your Visa card safer than cash, and much easier to carry, you can be assured of acceptance at tens of millions of merchants and two million ATMs in more than 200 countries and territories worldwide. With this mobile application, you can find the latest Visa offers and promotions overseas or nearby – from travel deals, to dining, entertainment, shopping and other lifestyle-related privileges – personalized to your interests. Welcome to Malaysia, Truly Asia! Plan a memorable holiday with Malaysia Trip Planner, the official travel app from Tourism Malaysia. Malaysia Map is a professional car, bike, pedestrian and subway navigation system. This app will help you determine your location, guide you to destination, plan your subway route, dinf nearby businesses and restaurants when you travel or live in Malaysia. It work completely offline that can save your money on data roaming cost. Tap, choose and enjoy your yummy meal from many restaurants in your neighborhood with foodpanda. Your one-stop food delivery service for all. One app, one account, 20+ countries! And all this for FREE! With our app you can order with only few taps from your favorite menu of restaurants like KFC, Pastamania, Burger King, Pizza Hut, Lotteria, Sakae and many others. In Jakarta, Bangalore, Kuala Lumpur and all over the world people are using the foodpanda app to discover the menu of the top restaurants and order food at home, lunch in the office or dinner with friends – whether you like Pizza, Burgers, Sushi, Italian, Chinese, Indian or any other of our favorite cuisines. HungryGoWhere Malaysia is your Kaki Makan who helps you discover what & where to eat in Malaysia. Search & discover the best restaurants & dishes, & locate them. Find out where your Facebook friends, food bloggers & experts are eating. Share your latest food finds as well. Embark on this journey of food discovery on HungryGoWhere Malaysia. Our free Kuala Lumpur Guide 4T is a mobile app that helps you find nearby attractions, hotels, most popular restaurants, nightclubs, sights, museums, ATM, pharmacy. This smart and intelligent mobile city guides are created to help you discover and plan your trip in Kuala Lumpur.